Get the scoop on what and how much your toddler should be eating with visuals of toddler serving sizes. I’ve talked at length on this blog about what my toddler[s] eat every day. I’ve gone so far to tell you that they’d happily survive off dinosaur chicken nuggets or grilled cheese. While I’m comfortable eye-balling toddler serving sizes and the number of times I serve a food group during the day, I know many of you out there are not. Why? Because feeding kids is hard. It’s scary. And frustrating. BEYOND frustrating. And you, being the great parent that you are, want to make sure your little one is not only growing well, but grows a love and taste for healthy food. So here’s a [visual] take on what and how much your toddler should be eating every day. But please, PLEASE, consider this information a rule of thumb for your toddler—- amounts vary on your toddler’s height and weight, personal food preferences, and yes, WHAT and HOW MUCH you can manage during the day. There’s a lot more to our days than just feeding kids. So make sure you cut yourself some slack. Now how to put this into practice…. well, my first bite of advice is to remember this: toddler or not, we all have days where we don’t finish our veggies at dinner, or feel like drinking a glass of milk with breakfast. For me, the head chef of the house, I try and include 3-5 food groups at each meal, and 1 to 2 food groups for snacks [read more about toddler snacking here]. And if my toddlers decide to eat a few bites of each food group then I consider it a win. 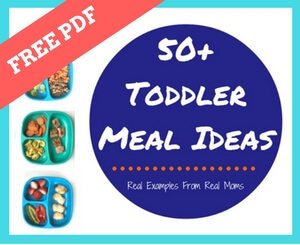 If you want to see how I plate our toddler meals you can see many more visuals in this 50 free toddler meal ideas OR 50 no-recipe meal ideas for kids! You can also follow me on Instagram because I’m sharing at least one to two toddler plates each week [adapted from Mom and Dad’s plate!]. Again, this post is meant to be a benchmark for you to make sure you’re on the right track for exposing your toddlers to healthy foods— and maybe give yourself a push to add a new fruit or vegetable to your meal plan! Thank you for these helpful visuals!! I have a really good eater (thank heavens) but this helps me realize I give her WAY more than I should expect her to eat most of the time. Feeding a toddler is SO frustrating. Thank you for this helpful guide! Thank you for stopping by and enjoying my posts!! Stay tuned I’m working on a feeding toddler course! Hi Katie, these meals look so appealing and healthy. Lots of great ideas I can pass onto my daughter! However, I feel I would be remiss if I didn’t point out that whole grapes are a choking hazard to children under the age of four due to the size of their tracheas. (The children…not the grapes.) Please remind people to cut them up. I used to cut my girls’ grapes into fourths when they were tiny. Thanks for letting me mention it. Hi, in wondering your thoughts on milk. My toddler loves milk but I can’t let him have too much otherwise he won’t eat other foods. Is it okay to let him only have one portion of milk if he eats cheese and yogurt during the day? He is 17 months now. Also I am unsure with cracker portion sizes? Your one picture says 2-4 crackers but there are a lot more in the picture. Thanks.